Ruby Graves, a young girl in Depression-era Alabama, faces the hardships of poverty and loss with as much faith as she can muster. At only the age of thirteen, she’s already lost a younger brother to illness, and now faces losing both her father and the boy who’s stealing her heart to illnesses as well. Armed with her beloved Scriptures, she prays daily for their healing, only to have her tender faith shattered by her father’s death. Through her pain, she’s able to connect with her long-lost Uncle Asa, who’s mere presence at his brother’s funeral brings murmurs of a scandalous past involving her parents and a prominent local pastor, Irwin Cass. When Ruby discovers that one of Asa’a many secrets is an ability to heal, and that she may be next in line for the “gift,” she vows to find the faith that has eluded her so far, a faith that could mean never losing loved ones again. But faith and doubt can’t reside in the same heart, not according to her father, and doubt is Ruby’s constant companion. As she struggles to find the true meaning of faith, she’s opposed at every turn by the pastor who would see her family destroyed and a community that can’t see deeper than the color of one’s skin. Through her search for a faith that could move mountains and a true understanding of her gift, can Ruby trust in a God that may require the ultimate sacrifice? “A fast-paced story that will leave readers wondering what’s next for Ruby Graves. This soulful, often poignant novel explores difficult subjects such as death, racism and religious hypocrisy, while still remaining hopeful. One of its greatest strengths is its cast of well-drawn secondary characters, including the...vengeful preacher who tries to thwart Ruby at every turn. Ruby’s unlikely friendship with a cast-out African-American woman and her child is a particularly bright spot in this often heavy novel." Healing Ruby is available at Amazon. This was a story with a great setting in an intriguing time. Ruby is young but isn't afraid to stand up for what she believes, and what she believes is that God is a loving God who preforms miracles, not a vengeful God who punishes. This was a refreshing read, those sometimes it was hard to read about the struggles of the characters. I never meant to hurt anyone. It was the last thing I ever wanted to do, but in moments that pass by quicker than lightning, things just happened. That seemed to be the story of my life. Things happened before I could stop them, before I even understood what was happening. Sometimes it was my eagerness that got me into trouble—like when I’d have to help Mother with canning all the vegetables, but all I could think about was getting out of that hot kitchen, sneaking down to the creek, and burying myself in the cold water. But most times, what got me in trouble was just plain anger. Like the time when I was ten, and Henry was harassing me again, and I was sick of him that day. I never understood what was so much fun about picking on girls, but that seemed to be the favorite pastime of both my brothers. Seemed to me that teenage boys could find plenty else to occupy their time with, and it would make me madder than a hornet. Maybe that was why they did it. We weren’t poor back then, back before stock crashes and poverty stole the life out of folks. But we weren’t like the Doyles either—we didn’t have a housekeeper to clean up after us—and since I was the only girl, I got stuck with washing the dishes after dinner every Sunday while the boys got to run off to do heaven knows what with heaven knows who. Henry should’ve just left me alone. But he never could pass up a chance to needle me, and he slapped my behind as he dropped his plate into the washtub. I must’ve gotten madder than I ever had before, cause I don’t exactly remember deciding to do it, but the next thing I knew, the knife in my hand went sailing through the air and landed in Henry’s neck. What happened after that’s still a blur. I was as horrified as Henry was, and we both stood there staring at each other in shock. I couldn’t even remember throwing that knife across the room. But there he stood a few feet away from me, a trickle of blood running down his neck and seeping into the collar of his Sunday shirt. I remember thinking that Mother would have a time getting that stain out on the washboard. She’d complain about her knuckles getting raw. Henry pulled the knife out, and blood shot out of him. It hit Mother’s tablecloth, the white one with the lace around the bottom that Grandma Kellum had made for a wedding present. It hit the wall and the doorframe where Henry stood. He stared at it kind of wide-eyed for a moment. Then just as Daddy came back in the room, Henry sank to the floor. Jennifer Westall dives into Christian characters to explore her own questions of faith. 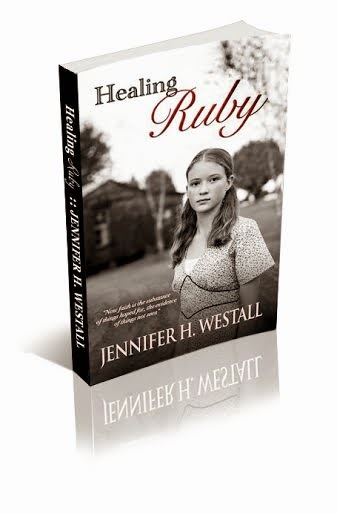 Inspired by the life of her grandmother, Healing Ruby (2014) is the first in the Healing Ruby series, which delves into the mysteries of faith healing. She’s also the author of Love’s Providence (2012), a contemporary Christian romance that navigates the minefield of dating and temptation. 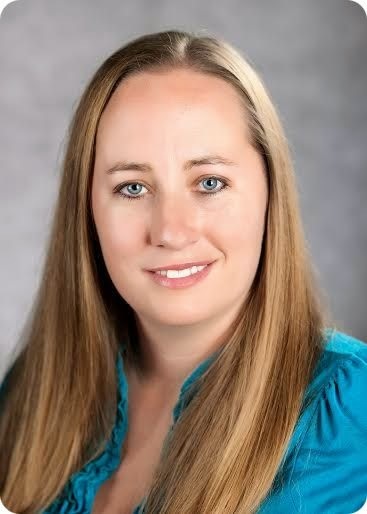 She resides in southwest Texas with her husband and two boys, where she homeschools by day and writes by night, thus explaining those pesky bags under her eyes. Visit Jennifer H. Westall’s website. Healing Ruby is about discovering the true nature of faith. It’s easy sometimes to fall into the mindset that faith is believing hard enough that God will do something you want Him to do. If I just believe strongly enough, God will heal my child. Or if I just keep believing with all my strength that God will make this job come through, then He will. But that’s not faith; at best it’s misguided faith. There’s a huge lesson in that statement. We pray so often for safety, for our loved ones to be okay, for our lives to be better or easier. We strive to have enough faith that God will make our circumstances the way we want them. But real faith, true ABIDING faith is an unwavering belief that God is good, that his mercy in unending, and that no matter our circumstances, He holds us in the palm of His hand and cares for us. Bad things are going to happen. We aren’t always safe. Sometimes God even calls us into circumstances that are unsafe. Look at the lives of the apostles. They were beaten and tortured, even killed. Faith isn’t safe, and God never promised us it would be. But we can have faith that He is good, and that His ultimate plan for our lives is for our good and His glory. I hope that’s what readers comes away with after reading Healing Ruby. I hope their faith is strengthened, and that they see the goodness of God in even their most trying circumstances. Wonderful post about Healing Ruby and a great reminder that Gid isn't a genie that grants wishes but the creator of all that is and He has the best plan for our lives even if it doesn't line up with what we want. Healing Ruby is a great story that demonstrates God at work in the life of a young girl even when her life takes twists and turns that at the time do not seem ideal.